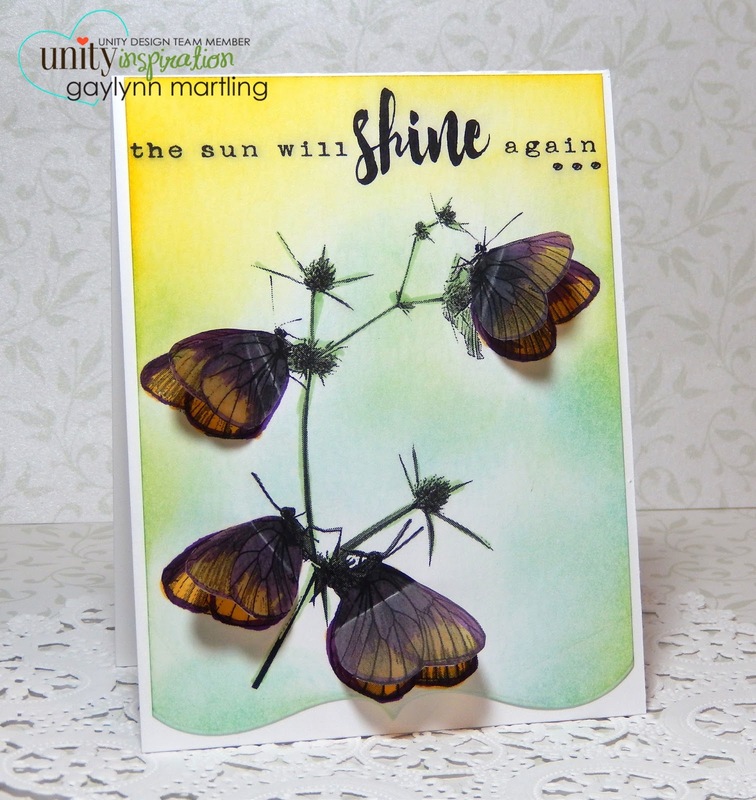 Here are life like butterflies and a pretty flower card for today. I am up on the Unity blog today with these creations. Sentiment: The sun will shine again. And here is a picture of the process. To make the wings, stamp the image twice, color, cut out one set of wings and glue or tape to the bottom wings. For the background, blend distress inks for an outdoor look. For my next project, I used a pretty flower and accented it with rhinestones. Sentiment: Be yourself. No regrets. For the background, blend layers of distress ink with foam to your liking. The more you add the darker the shades. The possibilities are endless. Supplies: Unity August 2016 SMAK Never Lose Sight and July 2016 Layers of Life Be Yourself. Hi there, Gaylynn here. Unity is hopping today. Be sure to visit all of the blogs listed below, including the Unity blog for two prize chances. 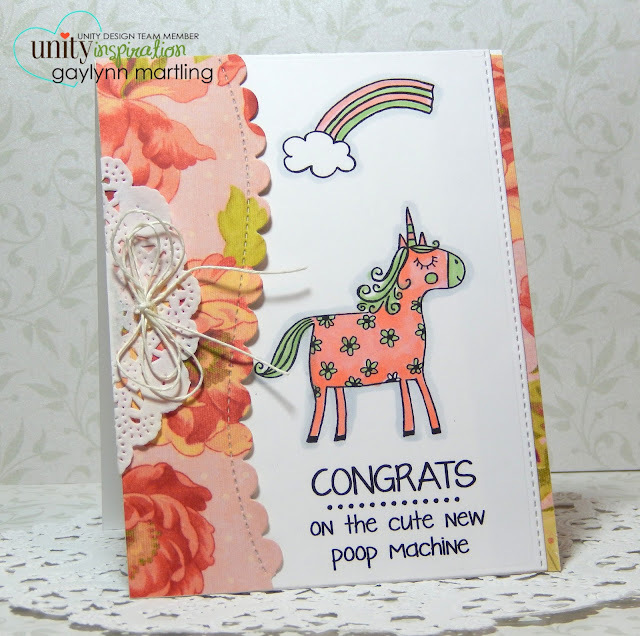 This cute and funny unicorn card is going to my niece for her baby girl shower. I paired two kits, Unicorns & Rainbows and Stinkin Cute Add On. This floral one is watercolor with colored pencils and the kit Steps of Courage. And finally, this butterfly card is watercolor with the July 2016 SMAK Heart's Reflection and the sentiment is with the July 2016 Sentiment Kit Let Your Wishes Fly. Check out the amazing sales going on beginning today at Unity. Here are pretty embossed gift or favor tags with a wedding theme. 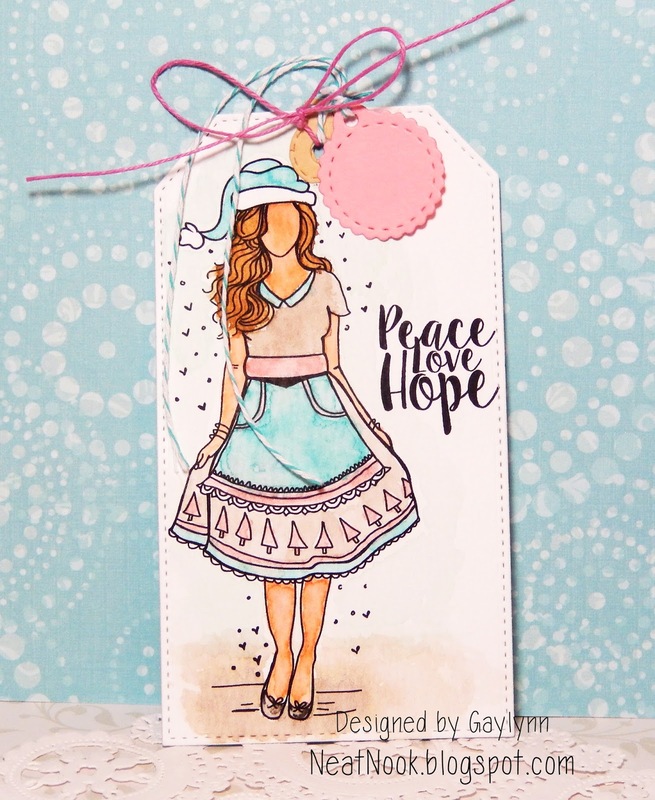 For every wedding, shower or party, pretty gift tags are a must. 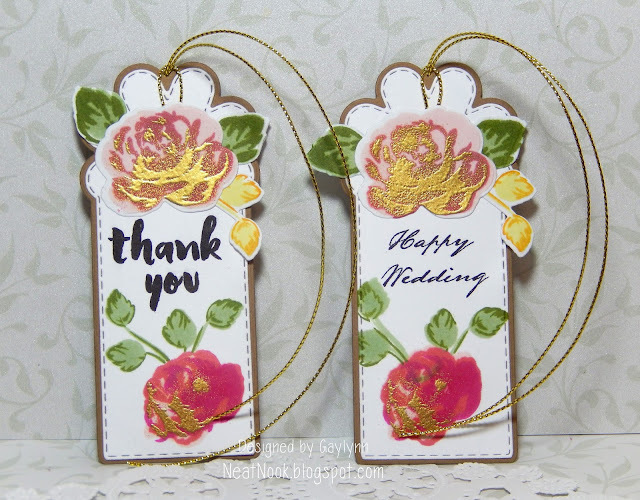 Supplies: Altenew stamps and dies from Vintage Roses and Painted Greetings and My Creative Time tag dies. 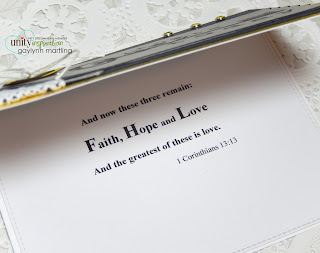 Here is a great card for anyone going though hardship who needs a little encouragement. Sentiment: Moving on is not about looking back, it's about taking a glance at yesterday and seeing how much you've grown since then. Supplies include Unity Aleaha Girl, Derwent Inktense watercolor pencils, MFT dies and pearls. This is a heartfelt teddy bear card for support and encouragement. Sentiment: If you are brave enough to say goodbye, life will reward you with a new hello. Here is another picture snapped during the watercolor process. This card could be for someone who has suffered a loss of a loved one or even for the loss of a pet. 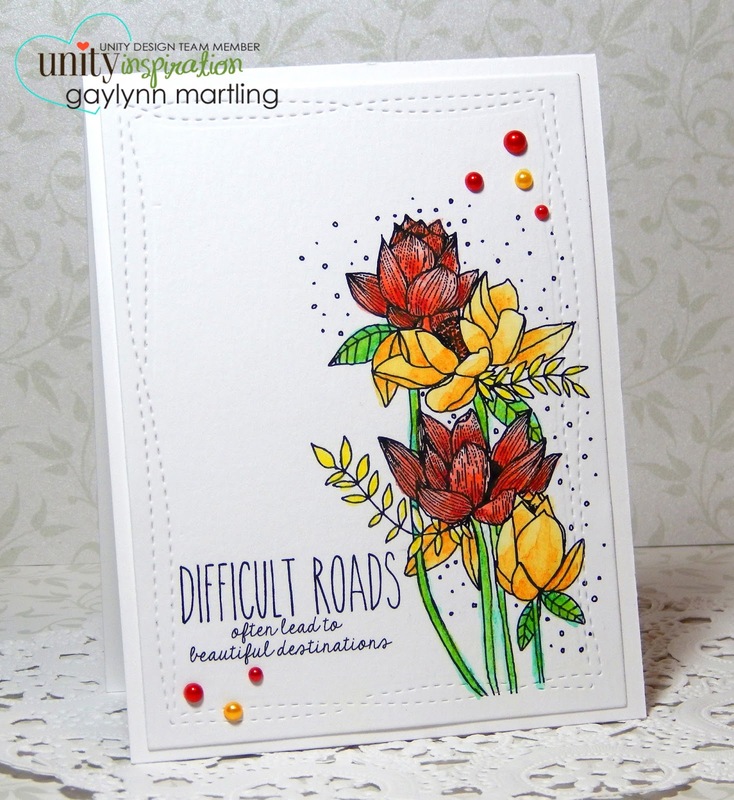 Supplies include Unity stamps Brave Enough, MFT dies, MCT dies and Derwent Inktense watercolor pencils. 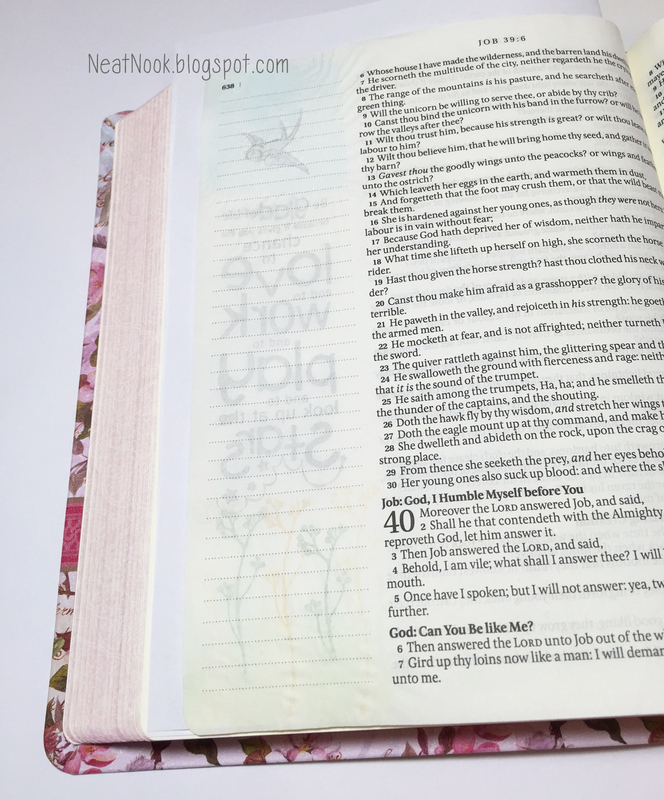 Today I am sharing a bible journal page stamped with chalk edgers. And here is the back of the page. You do see a slight shadow, but no more than the images that come with the book. Still no bleed through with stamping. This makes me a happy camper. Hooray!!! Please note that I am fairly new to the art part of bible journaling. I am sharing my bible journaling art process, trials and errors along the way. I am a card maker, and discovered quickly that what works for cards may not work on these THIN pages. Recommendations and suggestions are welcome. The chalks dry quickly but smudge if not dried completely. If watercolor is used, I recommend doing watercolor first and dry before stamping with chalk inks. Supplies include Unity Birdie Inspiration, Prima Chalk Edgers, Derwent Inktense watercolor pencils, My Creative Bible. Here is a Christmas holiday tag in non-traditional colors. I like to have tags like these ready for holiday gifts, wine bottles, baked gifts, decoration and more. This one has a little blank tag at the top to write to and from. I like to add these tiny tags so that the big tag can be reused by the recipient, if they choose to do so. I used watercolor on this for a soft and imperfect look. Supplies: Unity Aubree Girl, watercolors and watercolor paper, MFT dies. This is a Christmas card in non-traditional holiday colors and with sepia tones. Sentiment: Sending you lots of Christmas cheer. This new image is one of my favorites. 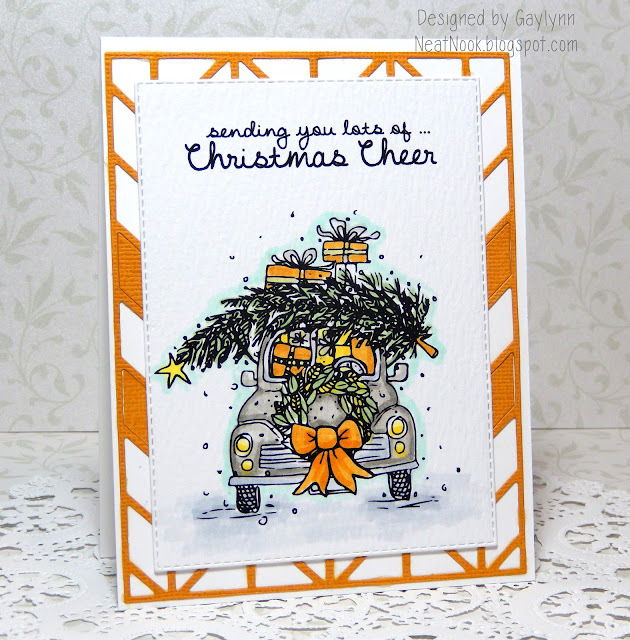 It's a VW Bug car filled with all things Christmas ~ a Christmas tree, gifts and a wreath. I wanted a vintage look, so I went with sepia colors. The background is a die-cut chevron pattern with an inlay. Supplies: Unity Love Bug Christmas, dies Lil' Inker Designs and My Creative Time and Copic markers. Another mixed media style card for most occasions. Supplies include: Unity stamps from Let Your Wishes Fly and Beautiful Elements, gelatos, water, vellum, Winnie & Walter dies. Here is a unique image with a bike carrying a Christmas tree and presents. I just love the sweetness of it. Sentiment: Happy Christmas with love. Supplies include Unity Classic Christmas, Copic Markers, dies by Pretty Pink Posh and My Creative Time. Today I have a winter card that can be for any occasion including Christmas holidays. Sentiment: Stay warm and cozy. Things you will need: A water bowl (or water brush), paint brush, watercolor pencils, stamped image onto watercolor paper and paper towel. For the girl, I used a narrow paint brush dipped in water and then dabbed the brush directly onto the tip of the pencil. This lifts just enough color for smaller areas and finer detail. Paint the sections using that color. To lighten areas while image is still wet, blot the brush onto the paper towel and then brush the image areas you want lightened to remove some color. This adds highlights. Dry with heat gun and repaint sections where you want even darker areas of that same color. Dry again. Move to other color sections and do the same, drying in between. For the background, make sure the paper is dry. Add water to the brush and brush water to the paper where you want the background to be. Add one color at a time to the brush (wet brush to pencil tip). Then lightly dip the brush onto the wet section of the background. Watch it flow. Add water to where you want that color to move. Pick up excess water with a blotted brush or paper towel. Dry. Try another color layer the same way once the paper is dry. The possibilities are endless with watercolor and color layers. I hope this helps. I would love your feedback and comments. Supplies: Unity Elsa Girl, Derwent Inktense watercolor pencils, paint brush, Ranger watercolor paper, water bowl, MFT dies, doily and snow glitter. This is a card I made for my daughter's birthday. She is an artist and so I tried to make it artsy for her. And this is part of the process with watercolor for the background. 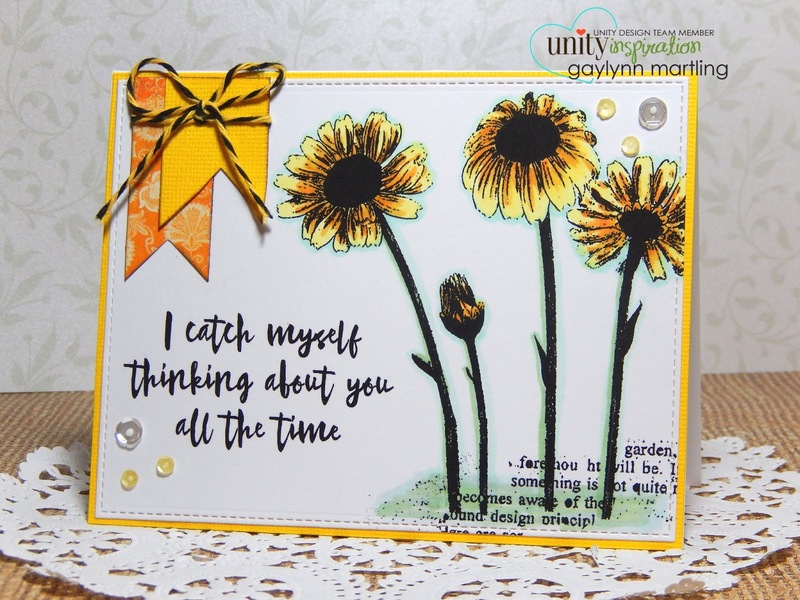 Supplies: Unity Let Your Wishes Fly and Beautiful Elements by JoJa, vellum, Gelato and watercolor paper. Here is a new version of a wedding card I made a while back. Sentiment: The key to today. 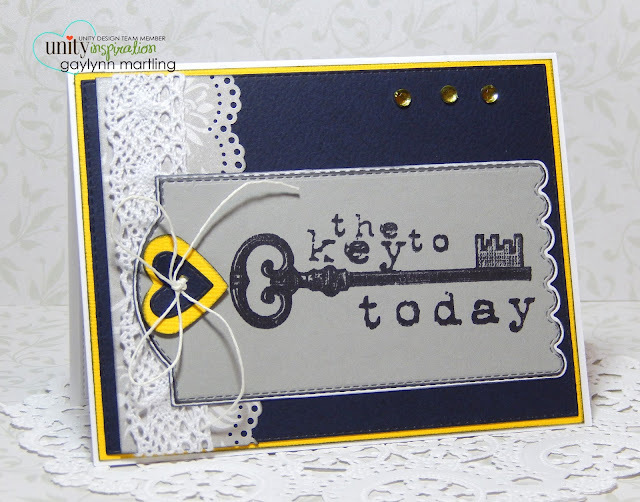 This vintage key is accented by the colors of Navy blue, yellow and gray. This is great for a wedding or anniversary. Supplies: Unity Stamp Co. Key To Today and My Creative Time dies. 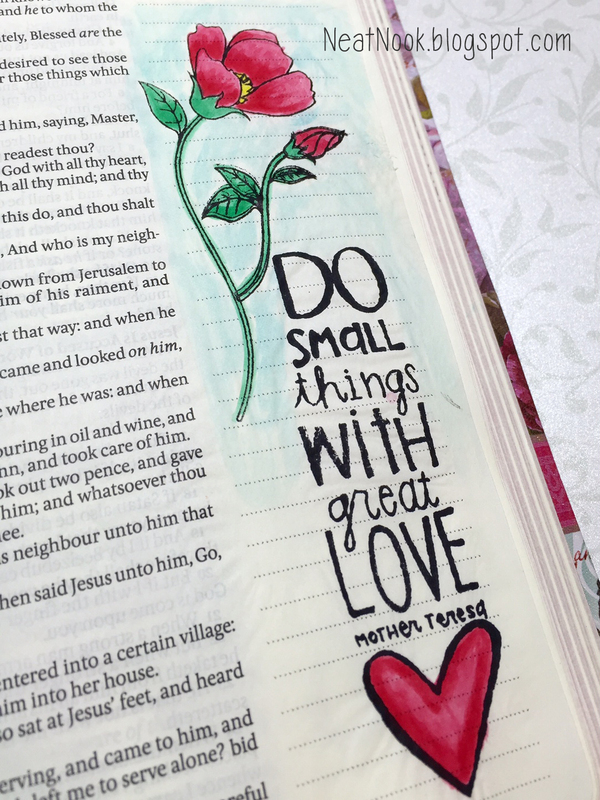 Another bible journal page, this time with different ink. I stamped the images with StazOn black ink. My ink pad was very juicy, and it did show on the back page. I used the water soluble oil pastels to watercolor. This time, I mixed the pastels with water and brush on a craft mat. The color was applied in layers, drying in between. The watercolor did not bleed through the page. I ironed the page between two pieces of paper. Here is the watercolor prep. And this is the back of the page. 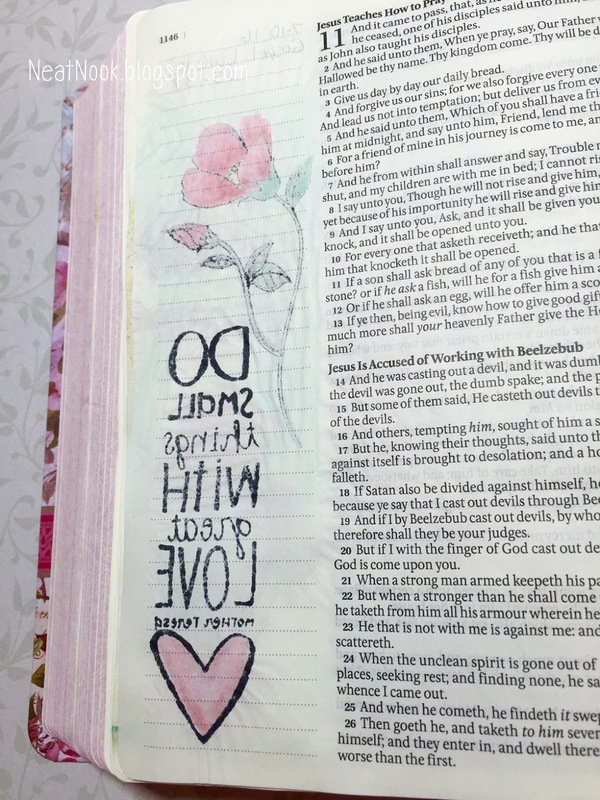 For my bible journal posts, I am keeping them focused on my art process along the way. My personal journal notes are kept private for the most part. Supplies: Unity stamp Small Things Great Love, My Creative Time Just Because flower stamp, StazOn ink, Prima water soluble soft oily pastels, brush and water. Comments and suggestions are welcome. Have a great day. Here is another page decorated with water soluble oil pastels. 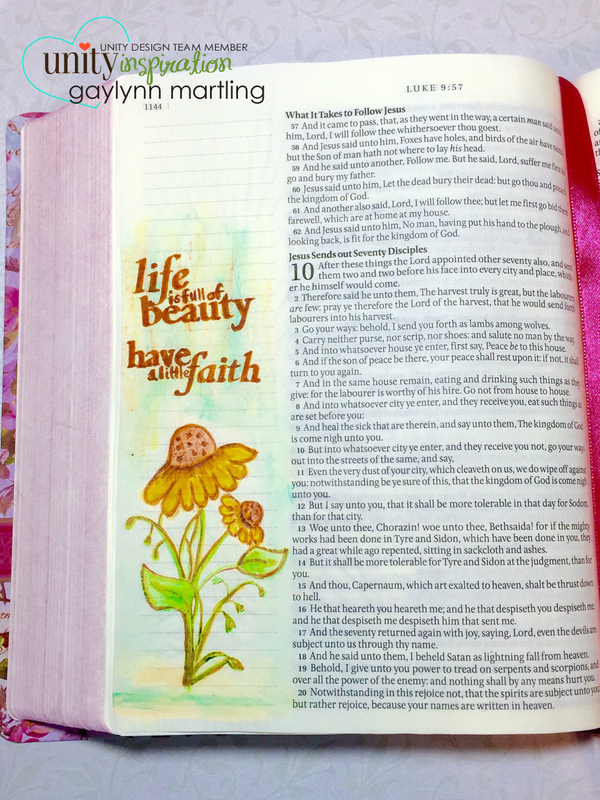 The decorating part of bible journaling is still new to me. I am sharing my trials and errors along the way. This was an experiment with another coloring option. The water soluble oil pastels are lovely for broad color and do not show through to the back side of the page. They also do not require page prepping and dry without a sticky feel. Next time, I will use a lighter hand with the oil pastels, dry and then layer colors. These water soluble oil pastels blend easily with baby wipes. Just dry between color layers. The paper wrinkles but can be ironed with a paper liner on each side of the page. Still exploring better stamp ink options for use with these thin bible journal pages. 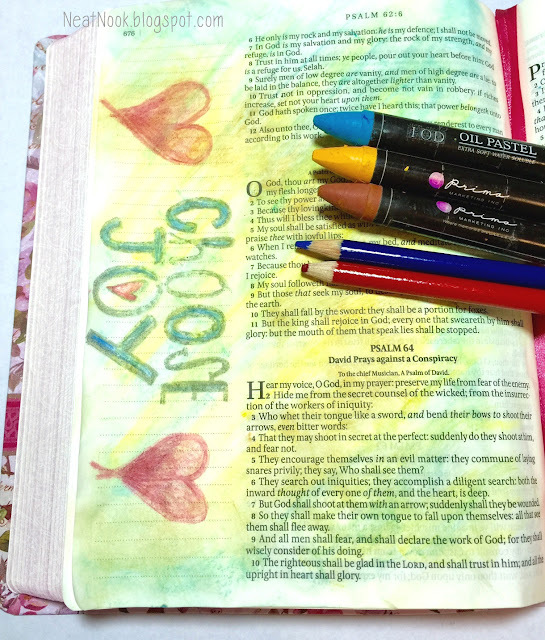 The hearts were drawn and colored with regular colored pencils. However, I prefer watercolor pencils, as they blend easily with a brush and water. 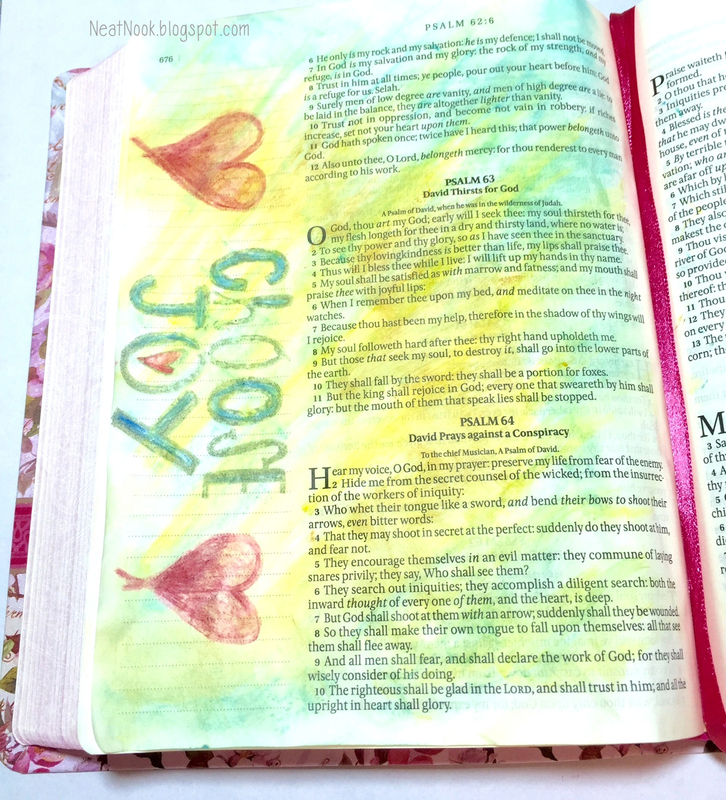 Supplies: My Creative Bible, Prima water soluble soft oil pastels, Unity stamp Choose Joy with a heart, colored pencils, heat gun and a baby wipe. That's all for now. I encourage helpful suggestions along the way. Here is a birthday gift tag with a little scene of tiny mountains. Sentiment: Breathe deep. Enjoy life. Happy Birthday. This tag inspires me to get outside. I used lots of different die-cuts on this one. The mountains were colored and then trimmed to place into the little scene above. I think this tag can be easily made for more occasions than just for birthday. Tag You're It #51 Outdoor scene with mountains instead of the flower. 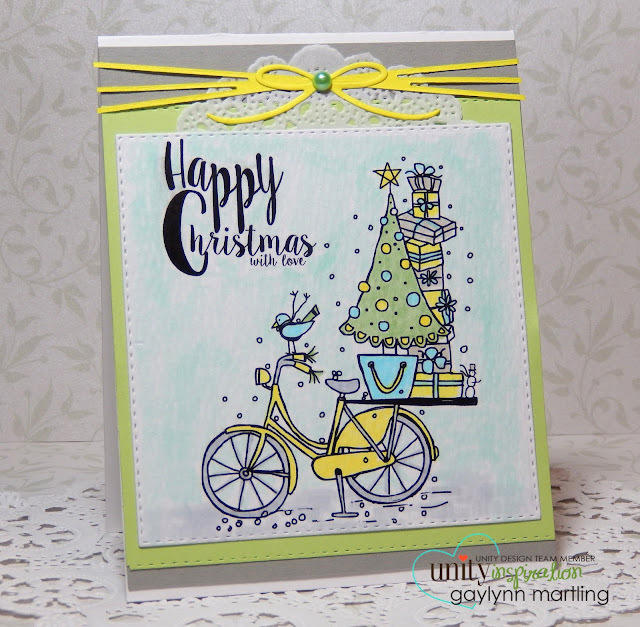 Supplies: Unity Stamp of the Week Tiny Mountains and with Party All Day, My Creative Time tag dies, MFT dies, Copic Markers and ribbon. Here is a thank you card with pretty purple flowers. Sentiment: Words are never enough. Thank You. I couldn't wait to make something with this beautiful flower. It includes water droplets, and I added more droplets to accent. Supplies: Unity KOM 7/2016 Glittering Eyes, MFT dies, Pretty Pink Posh small water droplets and Copic markers. Today I practiced bible journal coloring. 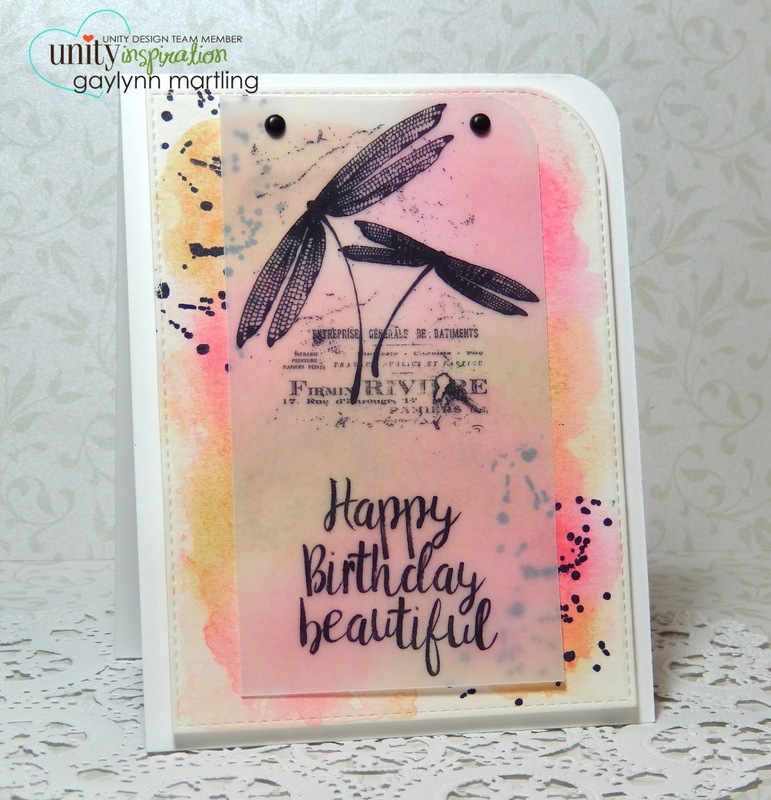 And here is the stamp set I used, Moments In Bloom. Sentiment: Life is full of beauty. Have a little faith. 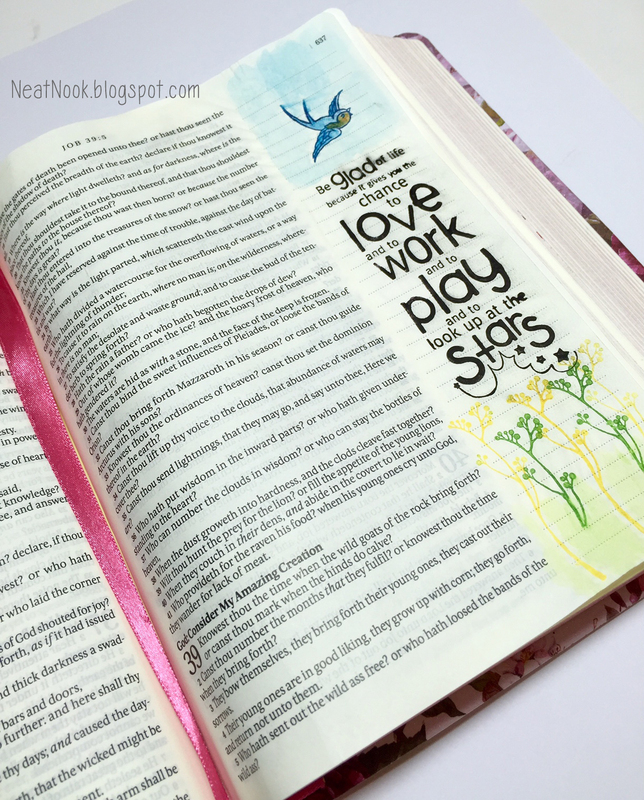 The biggest challenge is finding the right coloring, ink, paint and markers that work with the thin bible paper. I like bolder colors but do not want the image to bleed to the back side of the page. I am still searching for the right mix and learning along the way. For the flowers, I initially colored the solid flower stamp with Gelato with a little water spray. It was very light, so I added color pencils and distress markers. I will use a lighter ink for sentiments in the future. I would love helpful suggestions or tips. Have a wonderful 4th of July holiday weekend. Today, I am up on the Unity blog with a project for the July 2016 SMAK kit. Sentiment: I catch myself thinking about you all the time. I just love these pretty flowers and the thoughtful sentiment. Supplies: Unity SMAK kit July 2016 Heart's Reflection, Copic Markers, Pretty Pink Posh sequins and twine. Have yourself a sunny Saturday.